Started up Dark Souls for the 4th time with the intent of this finally being the one. Just killed the Bell Gargoyles on my first try, and I've only made it past them once before, so suffice to say I'm feeling pretty good at the moment. If you can make it to the stairs behind the Capra Demon your chances of survival increase by quite a bit. Just a bit of advice from me to you. [QUOTE="I am nobody, post: 1590988, member: 34539"]Started up Dark Souls for the 4th time with the intent of this finally being the one. Just killed the Bell Gargoyles on my first try, and I've only made it past them once before, so suffice to say I'm feeling pretty good at the moment. 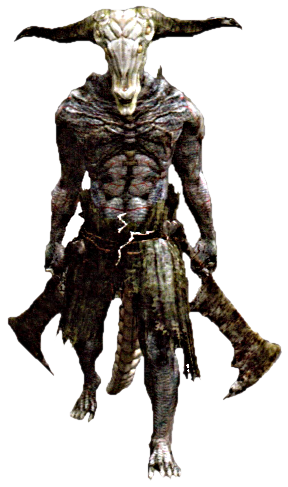 kinda weird, Bell Gargoyles is supposed to be the "Where the REAL Dark Souls Begins" because Undead Asylum is just tutorial and Taurus Demon is a bit of an "eh" boss that most difficulty comes from not accidentally getting knocked off the bridge and even still it'll follow you off. Bell Gargoyles is kinda tough and then you find out you have to fight TWO. But maybe it's just me, but summoning Solaire just makes boss fights so much easier, not that I'm complaining I haven't even died yet and I've downed Gaping Dragon and am ready to hit some side areas to get some new armor. Yeah, I think Carpa Demon is what ended it for me last time. That's the one with all the dogs around it in a tiny space where the camera freaks out, right? back at the rift Baby! Also, yes, IAN. That is the Capra Demon. Currently playing Dungeon Defenders 2, really exited for the Void Lord release next patch and League of Legends. I will get on Skyrim and Fallout every now and then too. Just got done playing through the first Bioshock for the 100th time it seems like, I was bored and figured i would play through them again because i really do enjoy them. I swear I didn't know I could plunge when I first played the game! Capra's dead. It hit me through the stairs, I abused its AI and hid on the stairs. That's pretty much the easiest way to do it. Especially if you have no magic. The wiki suggests there is no quick way of dealing with slimes if you don't have fire. Someone tell me that's wrong and I don't have to spend 5 minutes slowly power attacking 8 of them in one hallway again. I always just hit them to death. They don't take much damage but they don't have much HP. IIRC their only attack is pretty telegraphed too.